Sally Ashmore is a long-time reader, first time contributor to MMM. A second-generation Mormon, she grew up in the mission field of Wisconsin and earned a B.A. in English from a small Catholic school in Iowa you've probably never heard of. She currently resides among other YSA's near historic Winter Quarters (Omaha), where she forces life to be interesting. A-Dub (read post) and LJ (read post) both had some wonderful recommendations for fine tuning the musical portion of our meetings, but Ms. Gladys Knight one-upped them before they even started. Upon becoming Mormon, she realized that the hymns we sang were, as she puts it, "tame." Growing up, she was used to more, um, vibrant music as part of worship services. She still loves LDS hymns, but wants everyone to connect to them and to each other better. Hence her organizing and directing the Saints Unified Voices (SUV) Choir. I recently had the opportunity to attend one of their performances. If you get the chance, GO. It's worth spending an hour outside in line and three hours in a metal folding chair in the gym, which is about what you'll pay. The whole get-up is volunteer work and most performances are held in LDS buildings, so no venue costs. The SUV choir is truly an inspired group that really does break down barriers of cultural differences in spiritual music. 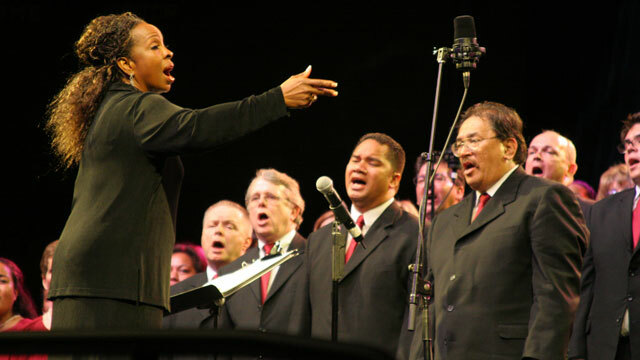 Their performances let not just non-members, but members, too, see how the power of music can impact our testimonies and open doors for everyone, regardless of heritage or personal religious history, to join together in praising our Heavenly Father through music.